On general, I have found any Apple hardware that I have used as pretty robust little things. I am notorious for not taking care of my stuff: my iPhone is kept in the same pocket as my car keys and is coverless, my iPad is thrown in my schoolbag with my charger and bottles of drinks, and my macbook, being my pride and joy, has taken more knocks than Rihanna. In general, I dont believe that I should have to modify these devices with protective covers, or adjust my ways by changing how I transport them. To me, that would be a consequence of bad design of the product. This is one of the reasons I enjoy Apple devices as they are normally pretty robust to the way I use them. Back in the NiCd days of batteries, which were used in everything rom laptops telephone and power tools, batteries had to be charged fully, then drained fully before the next charging to give the batteries a long life. 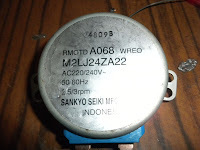 If you did not do this, they suffered from what was called a "memory effect" where crystals would grow on the anode and result in a diminished capacity of the batteries. The li-ion batteries of today do away with this memory effect. No longer can these crystals grow to shorten the lifespan from intermittent charging. The batteries can be pretty much charged when and for as long as you like without a significant shortening of their lifespan. 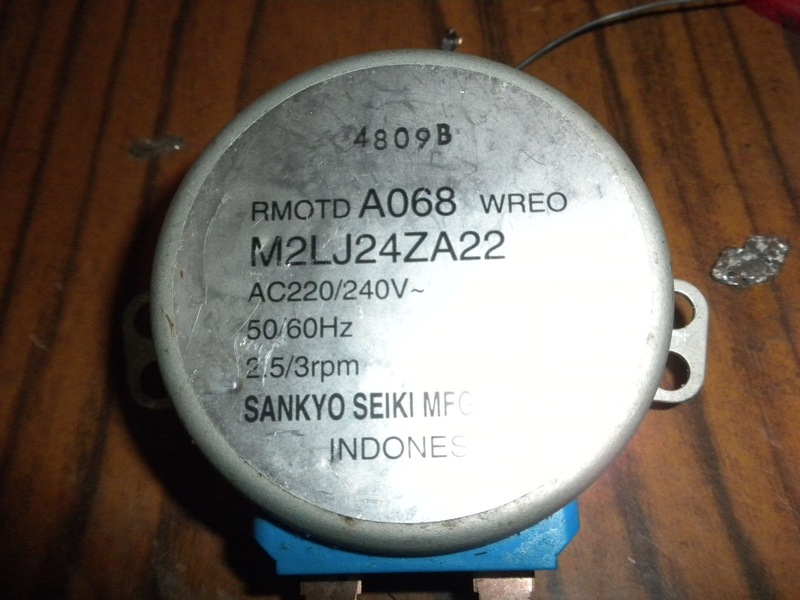 Another battery technology that was introduced around the same time was battery management circuitry. These little chips sit in the battery packs and record how much charge goes into the battery during charging, and how much charge goes out of the battery while it is in use. This is useful, as when the chip detects that the battery is taking in no more current while it is in charge, it knows that the battery has reached "100%" charge. Similarly when the battery cannot produce any more current during use and the voltage drops, it has reached "0%" charge. By keeping a running tally of how much current has left the battery since the last charge, the battery can report to the device how much charge is left in the battery. As such, this technology enables the device to inform you pretty accurately of what percentage charge is left on your device. The battery management circuitry can also do some other neat tricks such as faster charging times. By knowing that the battery is near 0% charge, it knows that it can take a large amount of current in a short time to take it close to the 90% level, and then reduce the current to "trickle charge" it closer to the %100 mark. This lowers the charging time of the battery while keeping the battery safe from overheating. However, this technology is not without its flaws. It can re-introduce a similar problem to the Ni-Cd "memory effect". When the battery management's running tally of the battery charge becomes out of sync with the actual charge that the battery, it can lead to some strange results. It can refuse to charge the battery, thinking that the battery is at full capacity already, when the battery is not. This can happen when it cannot measure the complete discharge or charge current that the battery can take. This can be caused by the device being left on charge for long periods of time, keeping the battery is at 100% indefinitely. This is what happened to my iPad. On one or two occasions it would indicate a certain charge level, say for example "4%". No type of charger would bring it past "4%". All I could do was unplug it and watch the level drop as I used it. No matter if the level was at 3% or 2% or 1%, plugging in the charger would say "Charging", but the percentage level would not increase. To repair this, I assumed that I would have to let the battery drain itself completely. COMPLETELY. Not at the "you have 10% battery left" level, and not at the "red battery warning symbol" level (see first image). This iPad had to be drained so much that it would be unresponsive when I clicked on the home button or the power on/off button. This had to be done so that the battery management circuit would know for sure that there was 0% charge left in the battery by the large drop in voltage. So I had three options. One was to leave the iPad in a drawer for a few days until it drained itself. However, this was not possible as I neeed it for work the next morning. 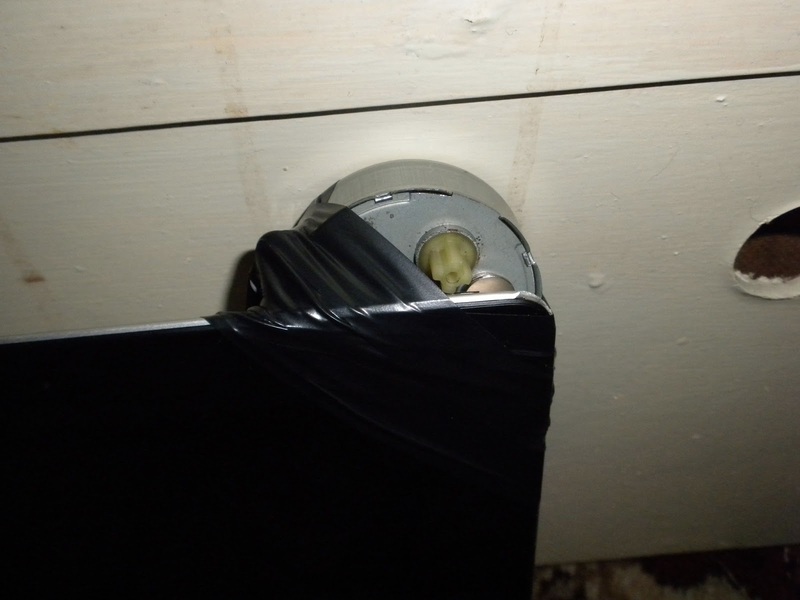 The other option was to open the iPad and drain the battery directly using a suitable load. However, ipads are very difficult to open without damaging the glass display. The final option was to keep pressing the power button so that the screen would light up and display the red battery symbol, and keep doing this until the ipad hadn't enough power to do it anymore. Now, I could either keep pressing the on/off button myself and go mad from the boredom (this could take hours), or I could come up with an automatic way. Choosing the latter, I needed a motor that rotated at a slow enough rate to press the power button at 5 -10 second intervals. 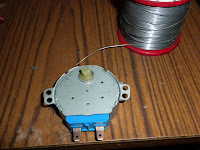 I broke apart an old microwave oven and salvaged the 220v motor that rotates the glass plate around inside. 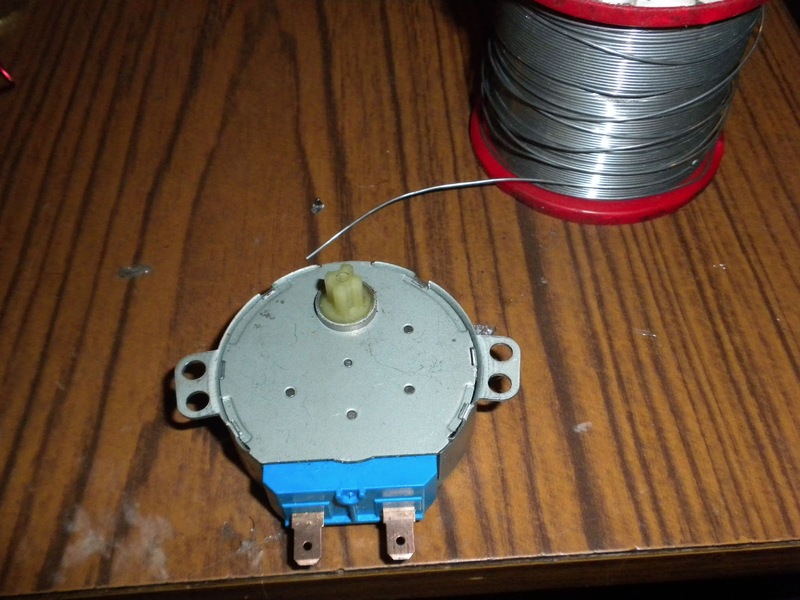 Taking the necessary safety precautions, I soldered a lead and a plug to the motor and insulated the contacts it using some polymorph plastic. Using copious amounts of insulating tape, I mounted the motor just above the power switch in such a way that the teeth of the small gear on the motor would press and depress the power button as it rotated around. 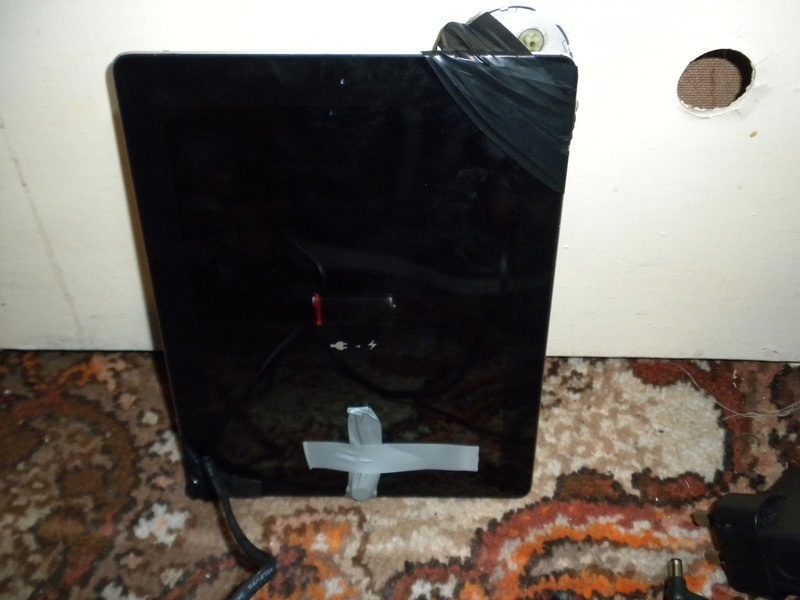 Once I had it taped in the correct position, I left the ipad and the motor running overnight. You can see a video of the iPad and motor in action here. 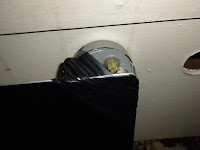 Note that I also taped down the home key with some insulating tape and a small coin, hopping that this would also aid the discharging process. When I picked up the iPad in the morning, the iPad was as dead as a dodo. No amount of clicking the home key or the power on/off key would wake it. I plugged the ipad into the official charger and sure enough, about 30min later, the charging symbol came up on the screen. Then the iPad woke, and the charging battery percentage began to climb! I was delighted. To make sure that everything was working as it should, i put the iPad through a few charge cycles before using it again as normal. Just to note, Apple warn you on their website to discharge your iPad and charge it fully at least once a month. I will be taking heed of this warning in future. The motor successfully turning the iPad on and off continuously. Hey I my friends I tell you something can you give me answer The first question to ask yourself is the purpose of buying a tablet. Do you want it for your kid? Do you want to replace your computer or laptop? Do you need it for internet on the go? Do you need it to make phone calls? Do you wish to listen to music and watch videos? What should be the storage capacity? Answers to all these questions will help you understand your need and select the best suitable tablet. When I saw various trouble in my Ipad I was serious frustrated then I Search by the keyword Ipad repair long island the company try their best to save the Ipad and they do it very efficiently. Sell Broken iPhone AppleShark is one of the best places to sell your iPhone or other Apple device. It doesn't matter if your iPhone is old, has a cracked screen, or wont turn on. If you have an iphone to sell, appleshark will make you a competitive offer. When you have an Apple product that you want to get rid of, you have two choices: you can sell or recycle. As a re-commerce service, appleshark specializes in buying Apple products you don't want anymore. You can sell your iPhone, iPad, iPod, Mac Apple TV, or virtually any other Apple device that you can name. Your blog is amazing! thank you so much for your creative inspirations and thank you for sharing. More information click on this http://goo.gl/GYDKQI. Thanks for this solution i am so glad to see this post . you have great expertise in ipad . lots of people looking great solution for apple product thanks . can repair it by my self at home? is there any tips that how to repair? Thanks for sharing informative post, which is so useful for us. Nice Video, Placewellretail.com is best online shopping place for HP Pavilion 13-s101TU at affordable price in India. if any one are looking for the mobile service centre contact Mobile phone repairs Bolton it is mobile repair centre in bolton . Adapters and cords is really important things for users that post is really helpful for us so if you want any cord and adapters to visit below website. Thanks for sharing this post because that's really helpful for all users related to electric products. That's really great post its all information is really helpful for me and other users. Thanks for sharing this post its all information is really helpful for all users.